It seems perfect that this story is emerging on Earth Day! We’d like to congratulate these surfing Ticos who abandoned the waves to give Mother Nautre a helping hand. 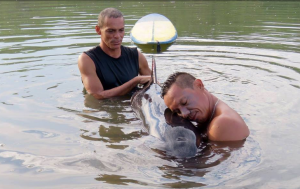 A five foot, baby pilot whale was rescued yesterday by a group of surfers in Boca Barranca beach in the Central Pacific region of Costa Rica. The animal was discovered by the men just after 5:00am when they headed to the beach to surf. One surfer, Muaricio Camareno, saw what looked like a black bag but on approaching it heard sounds coming from it. “She was very weak and couldn’t stay afloat,” commented Camareno. He decided to move her back to the ocean with his surfing companions, but it took them six hours since she was so heavy. Authorities were contacted during the rescue, but the surfers decided that official protocol would be too lengthy in this case of ‘the baby whale who had simply gotten lost’, and so took matters into their own hands. When the whale was returned to the ocean, it returned to the surfers four times until it finally swam away — presumably to rejoin her mother. The surfers are used to seeing dolphins and even crocodiles in the area, but said it was the first time they’d come across a whale!